Mahindra Roxor Vs Mahindra Thar: What's The Difference? 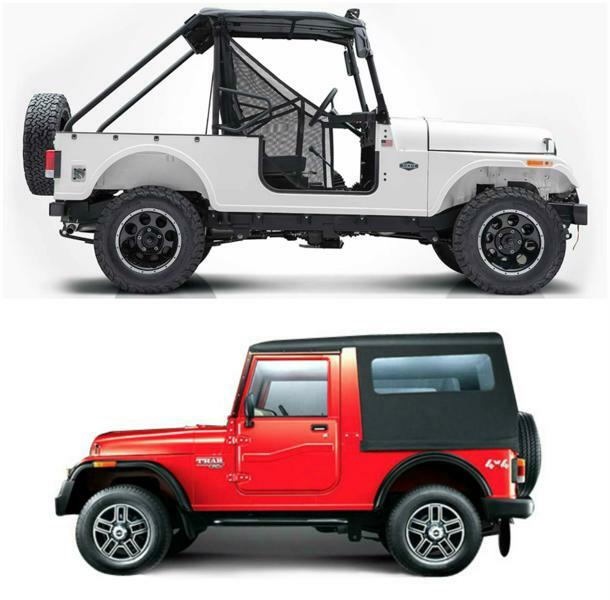 Mahindra Roxor Vs Mahindra Thar is a detailed comparison report between the two hard-core offroaders from Mahindra. We compare these two 4×4 against each other on a number of different parameters like design, features, engine specs and a lot more. Mahindra has recently launched the Roxor 4×4 in the American market. This off-roader is specifically designed to tackle the extreme terrains and is based on the Thar 4×4 currently on sale in India. The Roxor has been developed in accordance with the Mahindra Automotive North America and is exclusive to the American market. So are there some major differenced between the Roxor and the Thar. Or is the former just a pumped up version of the latter. We aim to find out in this exhaustive comparison report. Read along to get all the details. 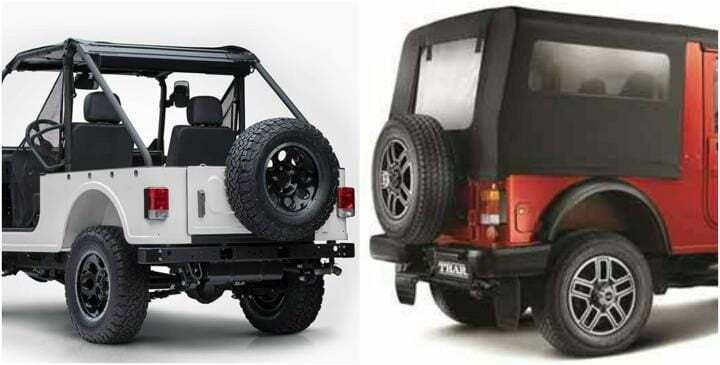 As stated earlier, in design, the Mahindra Roxor looks quite identical to the Thar, That said, the Roxor comes with a number of subtle differences. For instance, the front grille. The Mahindra Roxor’s grille features a slightly different design as compared to the one seen on the Thar. This is because Mahindra wants to avoid conflict with Jeep. Thar’s grille design is identical to what Jeep uses on their SUVs sold in America. Another point of difference is that the Roxor uses a Polyurethane body. While the Thar comes with a Steel Body. The Roxor, unlike the Thar, is not road legal. MANA has given no doors to the Roxor, no windscreen and no roof. The use of Polyurathene body structure and skipping the aforementioned body panels makes the Roxor light on its feet. A fact which will make it agile off the road. For added strength, it comes with a roll-cage. Unlike the Thar which comes with a proper cabin with door, windshield and a metal roof. Unlike the Thar, the Roxor comes with chunky off-road spec tyres with 16-inch rims. Mahindra Roxor’s cabin is completely barebones. In fact, there is no dashboard altogether. What you get is a metal sheet with a singular large dial along with switches for various operations. This is identical to the Jeeps of the past. The passenger seat does get a grab handle and that’s it. The Mahindra Thar’s dashboard, in comparison, is quite plush. It gets a dual-tone colour theme. A proper instrument cluster, air-con vents and glove box. The design has evolved over the years, with the recent update in 2015. The Mahindra Roxor is powered by the same engine which does its duty on the Bolero. This is a 2.5-litre M2DICR motor. It produces 62 BHP along with 195 NM of peak torque. A 5-speed manual gearbox is available. The power is sent to all the four wheels with the help of a manual four-wheel-drive-shift lever. Roxor comes with a four wheel drive low and a four wheel drive high options. The Mahindra Thar, on the other hand, comes with two engine options. Ther base variant gets a 2.6-litre MDI 3200TC engine. This motor churns out 63 BHP along with 182 NM of peak torque. Both four-wheel drive and two-wheel drive options are available. The top end variant comes with 2.5-litre NEF TCI-CRDe engine. This motor is capable of putting out 105 BHP along with 247 NM of peak torque. This one comes standard with a four-wheel drive. Roxor’s production will take place in America. Kits will be sent from India and assembled at Mahindra new plant in Detroit. Talking about the prices, the Roxor costs $15,000, which translates to INR 10 Lakh. On the other hand, a Thar’s base two-wheel drive variant goes for INR 6.39 Lakh with the top-end variant costing INR 9.11 Lakh (ex-showroom).